Endothelial progenitor cells (EPCs) are crucially involved in the neovascularization of ischemic tissues. This method describes the isolation of human EPCs from peripheral blood, as well as the identification of their migratory potential against serum samples of cardiac surgical patients. Emontzpohl, C., Simons, D., Kraemer, S., Goetzenich, A., Marx, G., Bernhagen, J., Stoppe, C. Isolation of Endothelial Progenitor Cells from Healthy Volunteers and Their Migratory Potential Influenced by Serum Samples After Cardiac Surgery. J. Vis. Exp. (120), e55192, doi:10.3791/55192 (2017). Endothelial progenitor cells (EPCs) are recruited from the bone marrow under pathological conditions like hypoxia and are crucially involved in the neovascularization of ischemic tissues. The origin, classification and characterization of EPCs are complex; notwithstanding, two prominent sub-types of EPCs have been established: so-called "early" EPCs (subsequently referred to as early-EPCs) and late-outgrowth EPCs (late-EPCs). They can be classified by biological properties as well as by their appearance during in vitro culture. While "early" EPCs appear in less than a week after culture of peripheral blood-derived mononuclear cells in EC-specific media, late-outgrowth EPCs can be found after 2-3 weeks. Late-outgrowth EPCs have been recognized to be directly involved in neovascularization, mainly through their ability to differentiate into mature endothelial cells, whereas "early" EPCs express various angiogenic factors as endogenous cargo to promote angiogenesis in a paracrine manner. During myocardial ischemia/reperfusion (I/R), various factors control the homing of EPCs to regions of blood vessel formation. Macrophage migration inhibitory factor (MIF) is a chemokine-like pro-inflammatory and ubiquitously expressed cytokine and was recently described to function as key regulator of EPCs migration at physiological concentrations1. Interestingly, MIF is stored in intracellular pools and can rapidly be released into the blood stream after several stimuli (e.g. myocardial infarction). 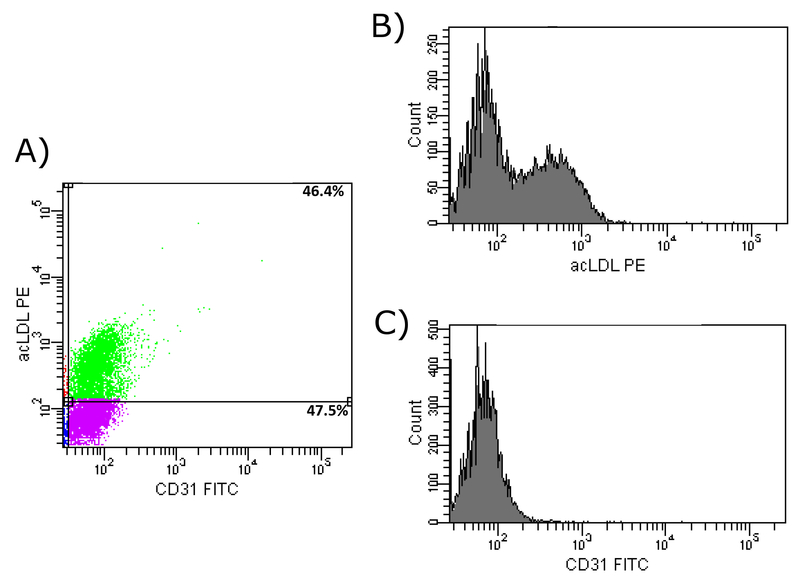 This protocol describes a method for the reliable isolation and culture of early-EPCs from adult human peripheral blood based on CD34-positive selection with subsequent culture in medium containing endothelial growth factors on fibronectin-coated plates for use in in vitro migration assays against serum samples of cardiac surgical patients. Furthermore, the migratory influence of MIF on chemotaxis of EPCs compared to other well-known angiogenesis-stimulating cytokines is demonstrated. Endothelial progenitor cells (EPCs) are circulating in the human blood and have the ability to differentiate into endothelial cells2. They participate in vasculogenesis and are capable of minimizing the damage caused by inflammation and ischemia/reperfusion (I/R) injuries in various ways3,4. For example, EPCs show elevated levels of intracellular antioxidant enzymes like catalase, glutathione peroxidase or manganese superoxide dismutases (MnSOD)5. The elevated resistance against oxidative stress allows EPCs to function in microenvironments with elevated reactive oxygen species (ROS) after ischemic injury6. Previous studies also indicated that the number of EPCs might be correlated to vascular repair and that a reduced number of circulating EPCs predicts the occurrence of cardiovascular events7,8. However, a clear definition of an EPC has not been found yet. Up to now, there is no specific cell surface marker or consistent phenotype for EPCs and these cells are very rare in the peripheral blood9. A human EPC should be considered as a circulating cell with the ability to contribute to the reconstruction of the injured endothelium and new vascular structures. One way of isolating and characterizing EPCs is through adhesion to fibronectin. Thereby, the capacity of these cells is used to show a superior adhesion to fibronectin coated dishes compared to type 1 collagen, for example3,10,11. However, others found that plating mononuclear cells on fibronectin-coated dishes without any previous or further purification step leads to colonies including myeloid progenitor cells, monocytes, and T lymphocytes12,13,14. Moreover, in this case, platelets might contaminate the mononuclear cell (MNC) fraction and thereby transfer plasma membrane proteins to any adherent cells15. Besides characterization through in vitro adhesion assays, a combination of different cell surface markers is used to describe a cell type considered as an EPC. In this case, after fibronectin-mediated adhesion, the cells are analyzed concerning their endothelial-like attributes. In this process, the two endothelial cell-associated markers, acetylated-low density lipoprotein (acLDL) and vascular endothelial growth factor receptor 2 (VEGFR-2, KDR), play a role. Endothelial cells and macrophages have been shown to specifically take up acLDL in a process called "scavenger cell pathway"16. Another marker protein is KDR as the main VEGF receptor on endothelial cells17. However, as EPCs in general are cultured in media supplemented with endothelial growth factors and fetal calf serum, it is possible that macrophages, which might also have been mistakenly isolated, exhibit an endothelial-like marker profile. As previously shown, if cultured in an endothelial-conditioned medium, macrophages express "endothelial-specific" proteins18. In general, there are two categories of EPCs within more subtypes, which can be found in the blood or be cultured in vitro. Late-outgrowth EPCs (late-EPCs) appear after 2-3 weeks of culture. These cells are integrated faster into a monolayer of human umbilical vein endothelial cells and can form capillary tubes19. Besides, so-called "early-EPCs" circulate in the blood for about one week and act in a more passive way through delivering angiogenic molecules, such as vascular endothelial growth factor (VEGF), or CXCL819. Patients with coronary artery disease (CAD) showed significantly lower amounts of early-EPCs compared to a control group without CAD20. Interestingly, the same group showed higher amounts of late-EPCs compared to a control group. Another study showed that early-EPCs protect differentiated EPCs from apoptosis under oxidative conditions in a paracrine manner6. Therefore, early EPCs might provide relevant protective effects through the migration of other cells in an auto- or paracrine manner within the peripheral blood. This protocol describes a method to purify early-EPCs by first isolating the PBMC-fraction from human peripheral blood and subsequently isolating CD34+ cells from the PBMC-fraction to clear this cell suspension from unwanted cells. CD34 is a marker, which is used for the isolation of human hematopoietic stem cells9. Afterwards, CD34+ cells are cultured on fibronectin-coated tissue culture surfaces. After three days, the medium is changed, thereby losing all non-adherent cells. Finally, isolated EPCs are stained to verify the uptake of acLDL and the presence of KDR as endothelial cell-marker by using fluorescence-activated cell sorting (FACS). As an additional marker, we analyzed platelet endothelial cell adhesion molecule (PECAM-1, CD31), which also occurs on endothelial cells. Restoration of damaged or infarcted myocardial tissue by enhanced recruitment of EPCs belongs to the intensively investigated treatment strategies in cardiovascular diseases. However, the translation of experimental results into clinical practice is still challenging, given the complex cellular interplay in the human body during various pathophysiological conditions. Furthermore, the myocardial I/R injuries trigger an excessive secretion of various cytokines, hormones and growth factors, which control the homing of EPCs to regions of blood vessel formation13. As already shown, CXCL8, stromal cell-derived factor 1α (SDF-1α, CXCL12), VEGF and macrophage migration inhibitory factor (MIF) are significantly increased in serum samples following myocardial I/R injury1. Among these factors, MIF is a pleiotropic chemokine-like cytokine with predominantly pro-inflammatory characteristics. In contrast to its historic name, MIF has pro-migratory functions, acting as a true chemokine on various cell types1,21,22. MIF-mediated cell recruitment processes have been linked to the chemokine receptors CXCR2 and CXCR4, which MIF binds to and activates in a non-cognate manner21. Of note, EPCs express both of these receptors on their surface, which additionally become up-regulated under hypoxic conditions23,24. Moreover, accumulating evidence suggests that MIF has an overall cardio-protective effect during I/R injury of the heart22,25,26. In this context, it has been further shown that MIF may support the neovascularization during hypoxic stress that is of particular relevance, when considering the limited recovery mechanisms of the injured myocardium27. Previous in vitro studies and experiments in pre-clinical mouse models provided first evidence about the role of MIF in EPCs recruitment4. Of note, MIF also is a prominent cargo protein of EPCs that may be released during EPCs recruitment within ischemic sites28. However, studies in clinical settings in particular in comparison with other (angiogenic) serum cytokines remain elusive. Blood for the isolation of EPCs was obtained from healthy volunteers after informed consent in accordance with the local ethics committee. Serum samples used in the migration assays were obtained from patients that underwent conventional cardiac surgery with the use of cardiopulmonary bypass (CPB). Exclusion criteria were emergency operations, known or suspected pregnancy, patient`s age less than 18 years, and failure to obtain informed consent. Serum samples were drawn in addition to clinical routine measurements (immediately before surgery and immediately after myocardial reperfusion/opening of aortic cross-clamp) and subsequently stored at -80 °C until final analysis. The institutional review board (Ethics committee, RWTH Aachen University) approved this study. The patients showed an average age of 68.6 years and an average weight of 81.7 kg. Pre-existing diseases included: hypertension (65%), chronic pulmonary disease (19%), extra cardiac arteriopathy (16%), cerebral dysfunction (6%), unstable angina (3%), recent myocardial infarction (28% within 90 d), chronic kidney disease (14%), liver disease (2%) and diabetes (34%). Prepare 5 mL fibronectin solution (1 mg human fibronectin diluted in 15 mL ultrapure water) per T75 flask. Add the solution to a T75 flask and wait until the water is evaporated. To avoid any unnecessary interruptions during the isolation process due to the evaporation, perform this process in advance (e.g. overnight) and at room temperature. This solution gives 4.44 µg fibronectin/cm2. Prepare the endothelial cell growth medium MV2 by supplementing the basal MV2 medium with the growth factor supplements provided by the manufacturer. NOTE: As the CD34-positive selection cocktail and the magnetic beads are commercially available in a combined selection kit, there are no concentrations provided by the manufacturer. However, about 100 µL of the antibody are sufficient for processing up to 5 x 108 cells. The magnetic beads are diluted in water, dextran-coated and about 5,000x smaller compared to other commercially available beads. For further information, see manufacturer´s instructions. Mix blood (with or without anticoagulants) 1:1 with Ca2+-Mg2+-free PBS. Add 15 mL of density gradient solution per 50 mL tube. For further information, see manufacturer´s instructions. Slowly layer the diluted blood on top of the density gradient solution. Centrifuge samples at 2,500 x g for 30 min with slow acceleration and without braking. Carefully collect the buffy coat layer of every tube (Figure 1) using a sterile plastic pipette and put it into another tube. Avoid collection of the density gradient solution. The expected PBMC yield is approximately 3-4 x 106 cells/mL blood. Figure 1: Density Gradient Centrifugation of Bbuffy Coat on Ficoll Solution. Shown is the result of the density gradient centrifugation at 2,500 x g for 30 min on the density gradient solution. Depicted are erythrocytes and granulocytes (red), the mononuclear cell fraction (white layer), plasma (yellow), and the density gradient solution (whitish). Please click here to view a larger version of this figure. 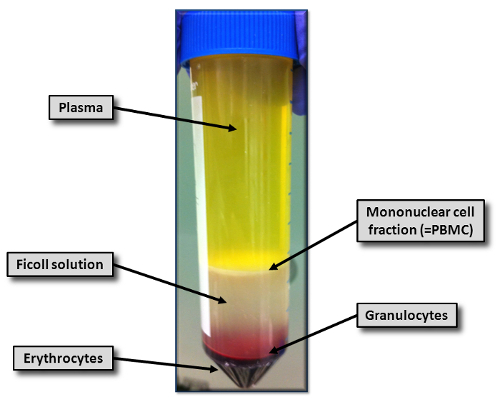 Dilute the peripheral blood mononuclear cell fraction with at least 3 volumes of PBS and mix. Centrifuge at room temperature for 15 min at 200 x g.
Aspirate the supernatant and resuspend cell pellet in 5 mL MV2 medium. Add 100 µL of human CD34 antibody (sufficient for processing up to 5 x 108 cells) per used buffy coat and rotate for 15 min at 37 °C with 5% CO2. Add 50 µL of dextran-coated magnetic beads per used buffy coat and rotate for 10 min at 37 °C with 5% CO2. After incubation, transfer the suspension to FACS tubes with a maximum of 3 mL in each tube. Higher amounts will not be permissible with the magnet. Insert FACS tube(s) into the magnet(s) and wait for 5 min. Discard supernatant without pulling the FACS tubes out of the magnet. Resuspend the cells in each FACS tube with 3 mL MV2 medium outside of the magnet. Pull the FACS tubes out of the magnets and resuspend the cells in 3 mL MV2 medium. Transfer the cell suspension into pre-coated T75 flasks and add 17 mL MV2 medium per flask. NOTE: The medium should be changed after 3 days. After one week, cells show spindle-like structures (Figure 2) and are ready to use. For an overlook of the isolation see Figure 3. Figure 2: Microscopic Image of Isolated EPCs. Shown is a representative image of isolated early-EPCs in a T75 flask prior to detachment. Apparent is the spindle-like structure of the EPCs. Please click here to view a larger version of this figure. Figure 3: Flowchart Showing the EPC Isolation Procedure. Depicted is a scheme, showing the single steps of the EPC isolation protocol. For a more detailed protocol see Section 2 in the protocol section. Remove the medium from EPCs in the T75 flask. Wash with 5 mL PBS by shaking it carefully. Remove PBS and add 5 mL commercial cell detachment solution. Wait until the cells are detached (check under a microscope). Accelerate the detachment by carefully tapping the bottom of the flask. When the cells are detached, quickly add 5 mL of MV2 complete medium and transfer the cell suspension into another tube. Centrifuge at 2,000 x g for 5 min. Resuspend cells in 5-10 mL PBS and centrifuge again at 2,000 x g for 5 min. Resuspend the cell pellet in MV2 starved medium (50,000 cells in 75 µL per transmigration well are needed). NOTE: Which migration system is needed depends on the cell type and assay. There are different pore diameters and plate sizes (number of wells). For EPCs a pore size of 5 µm in 96 well system is optimal. Prepare the migration plate by adding 235 µL of the serum sample (serum diluted 1:5 in MV2 starved medium) into the lower chamber (Figure 4). Figure 4: Migration Assay in a Modified Boyden Chamber. Shown is the general design of a modified Boyden chamber. 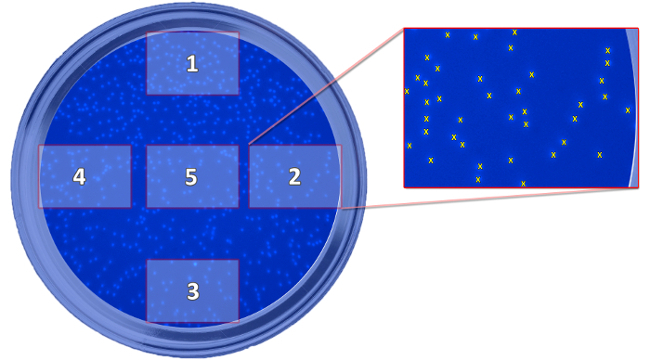 The cell culture inserts (= upper chamber) are indicated in dark blue and are inserted into the lower chamber. The bottom (but not the walls) of these inserts represents the filter system including the pores. (a) Shows the setup at time point zero. (b) After a chosen time point, cells are migrated through the filter towards a stimulus. Please click here to view a larger version of this figure. Add the insert shortly prior adding the cell solution. Add 75 µL of the cell solution (= 50,000 cells) into the upper chamber. Let the EPCs migrate for 3 h at 37 °C and 5 % CO2 (migration time depends on cell type and system). To avoid serum auto-fluorescence artefacts, quantify migrated cells by taking pictures of the well under a microscope and count the cells using the semi-automated software "ImageJ". Remove the upper chamber (containing all non-migrated cells). Add 70 µL 3.6% paraformaldehyde solution, including Hoechst dye (diluted 1:1,000). The plate can be stored at 37 °C and 5% CO2 overnight. Centrifuge the plate shortly to get all cells into the same focal plane at 2,000 x g for 1-2 min. Take 5 pictures per well (Figures 5 and 6) with a 100x magnification. Figure 5: Scheme Showing the Position of the Taken Pictures. The scheme depicts the position of the five taken pictures, which are needed for the determination of migrated cells, in relation to the well. The pictures are taken to count the cells and calculate a mean value for every well. Please click here to view a larger version of this figure. 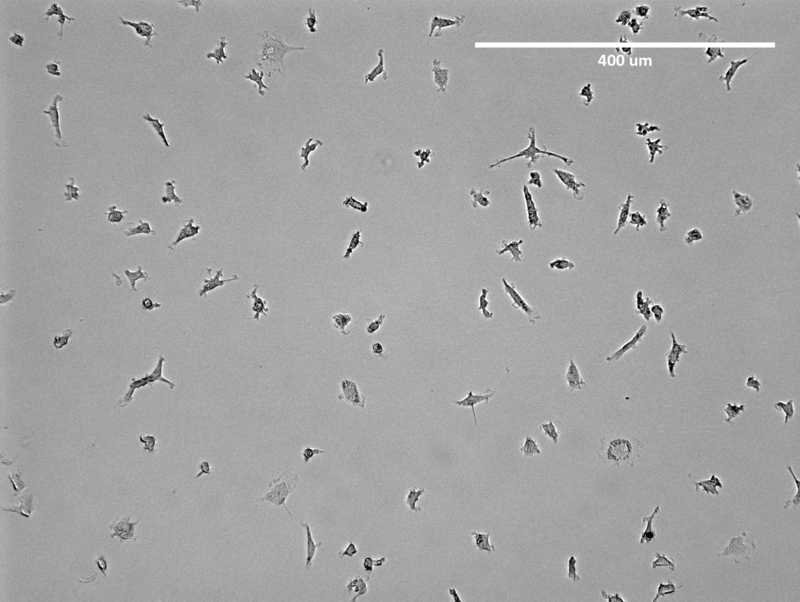 Figure 6: Microscopic Image for Cell Quantification. Shown is a representative image, which was taken for cell quantification. The cells were stained and fixed using Hoechst dye in 3.6% paraformaldehyde. The dots represent fixed and stained endothelial progenitor cells. Please click here to view a larger version of this figure. Count the migrated cells by using the semi-automated software "ImageJ" by the National Institute of Health. First, the uptake of acLDL was verified, as well as the expression of KDR, and CD31 on the surface of the isolated cell population. As Figure 7a shows, 85.1% of the isolated EPCs showed an uptake of acLDL and expressed CD31. Figures 7b and 7c further demonstrate a homogenous distribution of both markers, although there seems to be a smaller population, negative for both markers. In a second step, FACS analysis of acLDL in combination with KDR was performed. 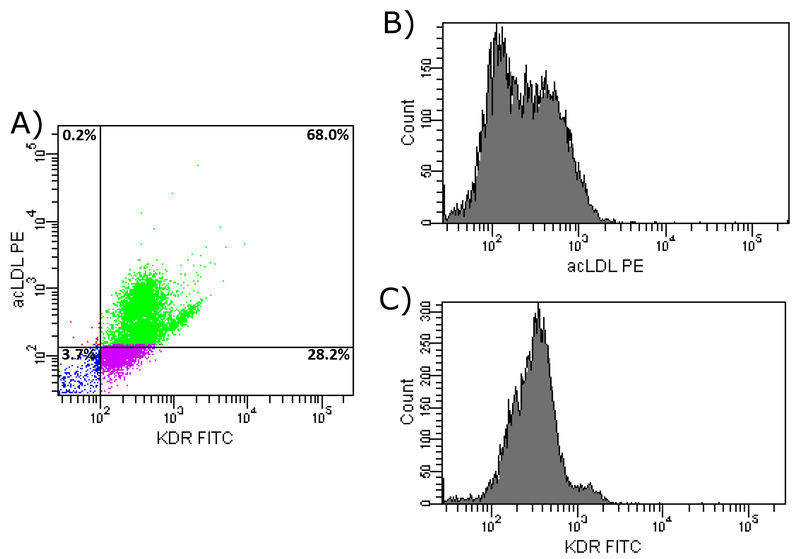 Figure 8a shows that over 80% of the isolated cells showed an uptake of acLDL and the expression of KDR on their surface. Figures 8b and 8c show the homogeneity of these markers. To verify the importance of fibronectin-coated dishes during culture time, a comparison of the three markers between isolated cells after two days of culture on a fibronectin-coated surface with isolated EPCs after seven days of culture on fibronectin-coated dishes (as stated in our protocol) was performed, both with previous CD34+-selection. 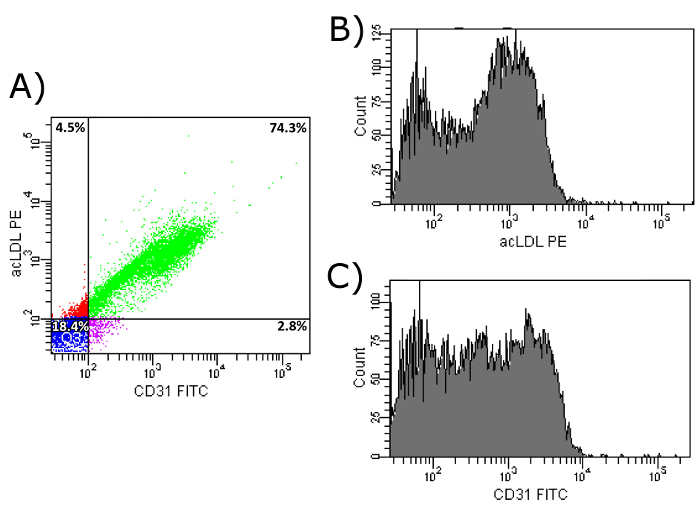 As shown in Figure 9a, only 46.4% of two-day-cultured cells showed an uptake of acLDL as well as an expression of CD31 on their surface, compared to 85% of the cells after seven days of culture on fibronectin. Moreover, the histograms (Figures 9b and 9c) show less intensity of both markers after two days of culture compared to seven days (Figures 7b and 7c). The same is true for a combination of the markers acLDL and KDR. 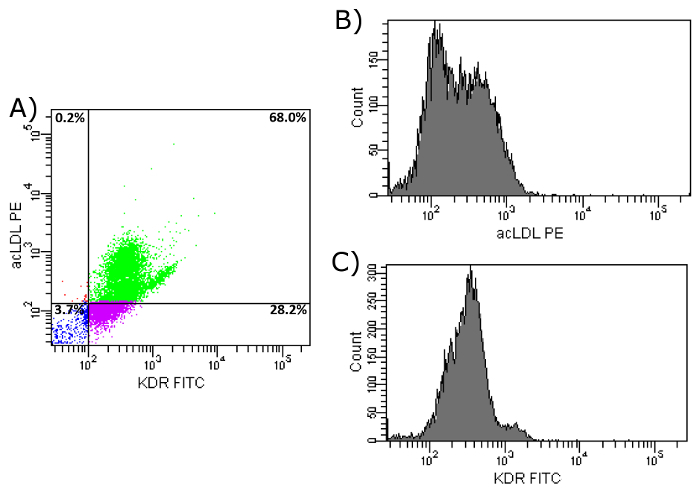 After two days of culture on fibronectin, only 68.0% of all cells showed an uptake of acLDL as well as an expression of KDR on their surface (Figures 10a-10c). After seven days of culture on fibronectin, 83.6% of the cells showed an uptake of acLDL and expression of KDR on their surface (Figures 8a-8c). In a next step, the importance of the CD34+-selection during the isolation of EPCs was evaluated. Therefore, cells selected in accordance to the present protocol, including density gradient centrifugation and seven days of culture on fibronectin, but which missed the CD34+-selection were isolated. 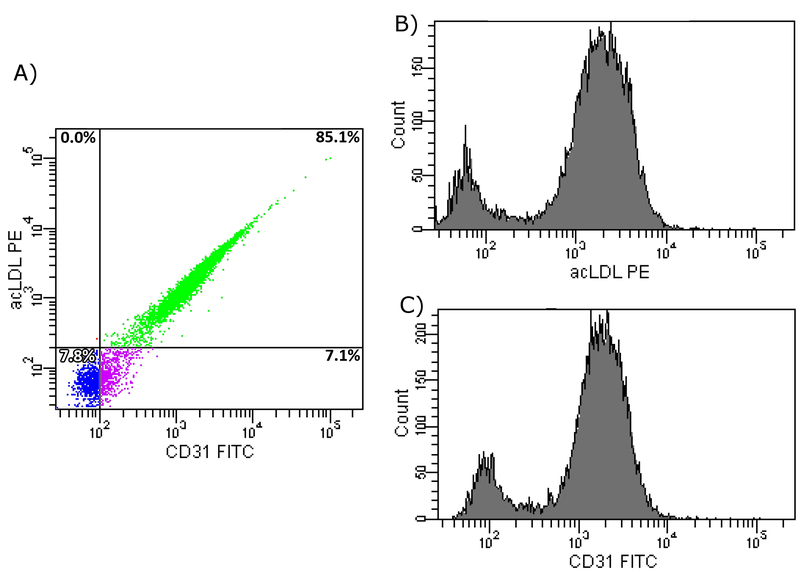 As shown in Figure 10a, over 18% of all isolated cells do neither express CD31 nor show an uptake of acLDL, compared to less than 8% after CD34+-selection, which show a CD31 expression and an uptake of acLDL (Figure 7a). In addition, Figures 11b and 11c show that the isolated cells are very inhomogeneous regarding both markers compared to the relating Figures 7b and 7c showing the same markers in a cell population with previous CD34+-selection. To identify the influence of cardiac surgery following myocardial I/R on the concentrations of circulating serum levels of MIF, CXCL12, CXCL8 and VEGF, serum samples were drawn pre- and intra-operatively for the subsequent analysis by commercially available ELISA (Figure 12). Serum levels of MIF showed a significant intraoperative increase compared to baseline values (100.3 ng/mL vs. 127.4 ng/mL, p = 0.027). Likewise, CXCL12 levels showed a significant increase in the serum during surgery (0.101 ng/mL vs. 0.198 ng/mL, p = 0.011). Similar to MIF and CXCL12, CXCL8 significantly increased during surgery (0.15 ng/mL vs. 0.3 ng/mL, p = 0.022). In contrast, VEGF concentrations did not show any significant changes during the observation period (0.154 ng/mL vs. 0.134 ng/mL, p = 0.583)1. To investigate the direct effect of patients´ serum samples and the therein contained cytokines/chemokines/angiogenic factors on EPC migration, an ex vivo migration assay using serum samples, which were drawn prior and during surgery, was performed. EPCs were isolated from healthy volunteers. 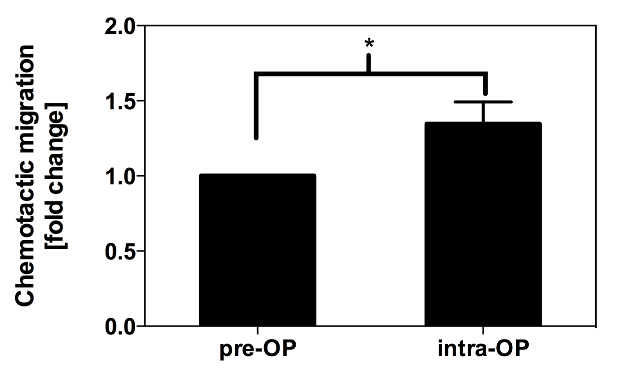 As depicted in Figure 13, EPC migration rate significantly increased toward the intra-operatively taken samples compared to pre-operatively taken samples (+ 35% compared to baseline, p = 0.047). Since previous studies already demonstrated that I/R triggers a secretion of several cytokines that modulate leukocyte chemotaxis and migration, migration assays using these potential chemoattractants, including MIF, CXCL12, CXCL8, and VEGF were performed. To get a better understanding of the influence of these cytokines on EPC recruitment in vivo, additional in vitro migration experiments, applying the physiologically measured concentrations of the above cytokines to the lower chamber of the migration devices were performed, too. As MIF serum concentrations between 100 and 130 ng/mL had been measured (Figure 12), a concentration of 100 ng/mL of recombinant MIF was used, which led to a >6-fold increase in EPC migration compared to the medium control (Figure 14). 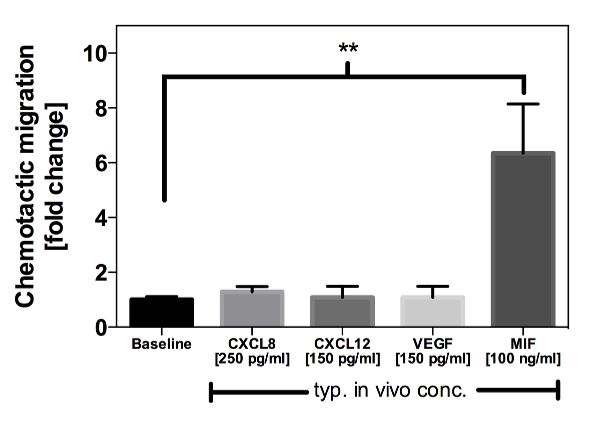 In contrast, the serum concentrations of CXCL12, CXCL8, and VEGF were in the range of 150 - 300 pg/mL. Of note, these concentrations did not mediate any effect on EPC migration in vitro (Figure 14). It is therefore conceivable that among these four cytokines, MIF exhibits the relative strongest influence on EPC migration in vivo1. Figure 7: FACS Analysis of Isolated EPCs on Day 7. 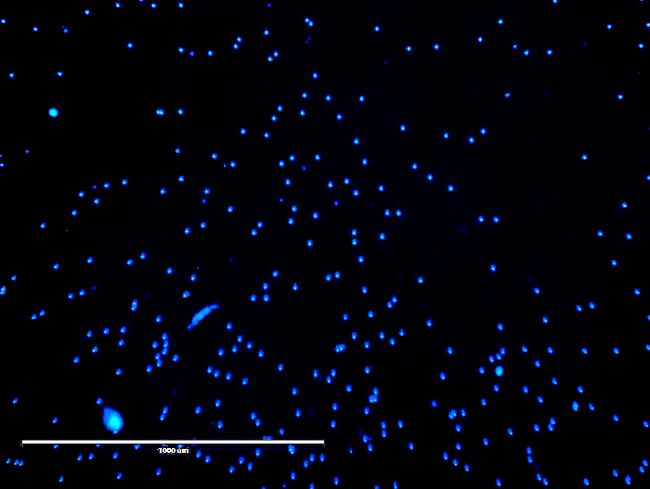 (a) Shown is the uptake of acLDL and CD31 cell surface expression of isolated EPCs after CD34+ selection and 7 day culture period on fibronectin-coated dishes. Upper left: Cells show uptake of acLDL, but do not express CD31. Upper right: Cells show uptake of acLDL and express CD31. Bottom left: Cells show no uptake of acLDL and do not express CD31. Bottom right: Cells show no uptake of acLDL, but express CD31. (b) Shown is the histogram of PE-conjugated acLDL after uptake by isolated EPCs. (c) Shown is the histogram of FITC-conjugated CD31 antibody after binding to cell surface CD31 of isolated EPCs. Please click here to view a larger version of this figure. Figure 8: FACS Analysis of Isolated EPCs on Day 7. 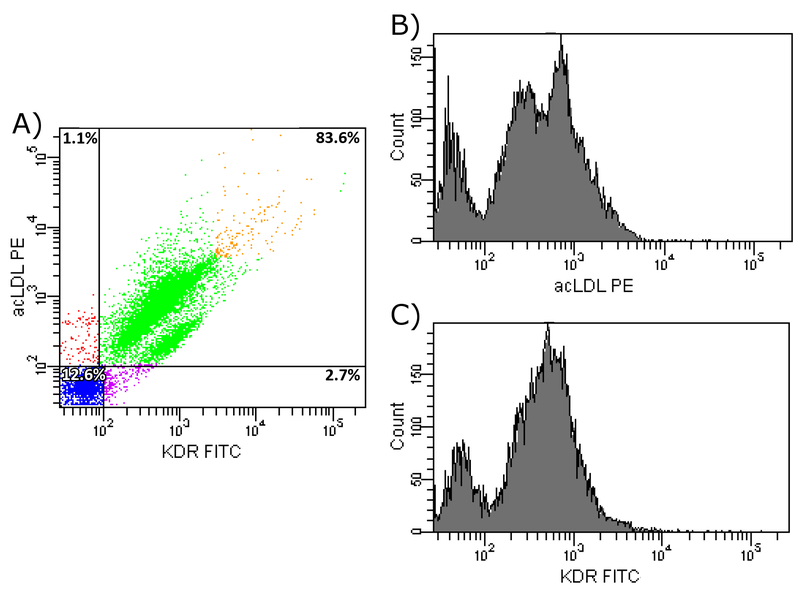 (a) Shown is the uptake of acLDL and KDR cell surface expression of isolated EPCs after CD34+ selection and 7 day culture period on fibronectin-coated dishes. Upper left: cells show uptake of acLDL, but do not express KDR. Upper right: Cells show uptake of acLDL and express KDR. Bottom left: Cells show no uptake of acLDL and do not express KDR. Bottom right: Cells show no uptake of acLDL, but express KDR. (b) Shown is the histogram of PE-conjugated acLDL after uptake by isolated EPCs. (c) Shown is the histogram of FITC-conjugated KDR antibody after binding to cell surface KDR of isolated EPCs. Please click here to view a larger version of this figure. Figure 9: FACS Analysis of Isolated EPCs on Day 2. 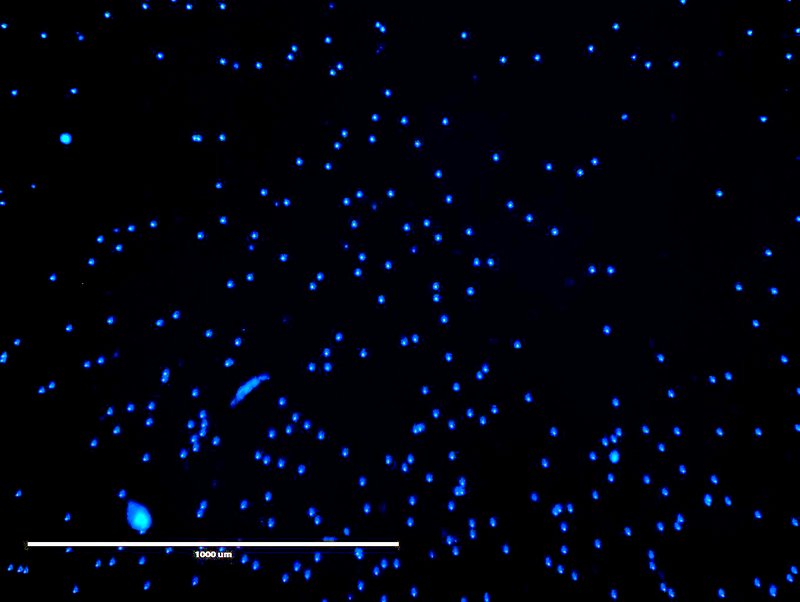 (a) Shown is the uptake of acLDL and CD31 cell surface expression of isolated EPCs after CD34+ selection and 2 day culture period on fibronectin-coated dishes. Upper left: cells show uptake of acLDL, but do not express CD31. Upper right: Cells show uptake of acLDL and express CD31. Bottom left: Cells show no uptake of acLDL and do not express CD31. Bottom right: Cells show no uptake of acLDL, but express CD31. (b) Shown is the histogram of PE-conjugated acLDL after uptake by isolated EPCs. (c) Shown is the histogram of FITC-conjugated CD31 antibody after binding to cell surface CD31 of isolated EPCs. Please click here to view a larger version of this figure. Figure 10: FACS Analysis of Isolated EPCs on Day 2. (a) Shown is the uptake of acLDL and KDR cell surface expression of isolated EPCs after CD34+ selection and 2 day culture period on fibronectin-coated dishes. Upper left: cells show uptake of acLDL, but do not express KDR. Upper right: Cells show uptake of acLDL and express KDR. Bottom left: Cells show no uptake of acLDL and do not express KDR. Bottom right: Cells show no uptake of acLDL, but express KDR. (b) Shown is the histogram of PE-conjugated acLDL after uptake by isolated EPCs. (c) Shown is the histogram of FITC-conjugated KDR antibody after binding to cell surface KDR of isolated EPCs. Please click here to view a larger version of this figure. Figure 11: FACS Analysis of Isolated EPCs on Day 7. (a) Shown is the uptake of acLDL and CD31 cell surface expression of isolated EPCs without previous CD34+ selection, but including 7 day culture period on fibronectin-coated dishes. Upper left: Cells show uptake of acLDL, but do not express CD31. Upper right: Cells show uptake of acLDL and express CD31. Bottom left: Cells show no uptake of acLDL and do not express CD31. Bottom right: Cells show no uptake of acLDL, but express CD31. (b) Shown is the histogram of PE-conjugated acLDL after uptake by isolated EPCs. (c) Shown is the histogram of FITC-conjugated CD31 antibody after binding to cell surface CD31 of isolated EPCs. Please click here to view a larger version of this figure. The first part of this study included the isolation of human EPCs from the peripheral blood of healthy volunteers to enable a comprehensive evaluation of the blood of cardiac surgery patients. Therefore, a density gradient centrifugation was performed to separate the PBMC fraction from plasma, granulocytes and erythrocytes. To remove most of the contaminating platelets, this cell fraction was subjected to short and slow washing steps29,30. Next, CD34+ cells were isolated from the remaining fraction to separate progenitor cells from the remaining lymphocytes, and monocytes. Finally, the cell suspension was cultured on fibronectin-coated dishes in a commercially-available endothelial cell growth medium to separate endothelial progenitor cells from other (progenitor) cells of the myeloid lineage3. Of note, it is discussed that platelets may show a CD34 cell surface expression, too. Although previous studies demonstrated binding of some anti-CD34 antibodies to platelets, this could be an artefact due to the aggregation of platelets with other (CD34-positive) cells31,32. However, most platelets can be separated by repeated slow washing steps. Beside platelets, their precursors – megakaryocytes – do express this hematopoietic progenitor cell antigen and might be present in peripheral blood, although they are mainly found in the bone marrow33,34. Moreover, it is also described that the cell surface marker CD34, used in this protocol is expressed in very low levels on mature endothelial cells35. Therefore, it is important to cautiously consider a possible contamination by platelets/megakaryocytes or mature endothelial cells, when isolating EPCs. Hence, step 2.6 is of particular relevance during the isolation of EPCs to remove platelets. To clarify the importance of culturing the isolated cells on fibronectin-coated dishes, cell populations after two days and seven days of culture on fibronectin were compared both with previous CD34-positive selection. On day two, less than half of the isolated cells showed an uptake of acLDL and simultaneous expression of CD31 on their surface. Moreover, a less intense expression of both markers on the regarding histograms could be seen. These data show that seven days of culture on fibronectin in the endothelial cell-specific medium are necessary to get EPCs showing characteristic endothelial expression patterns. In this step, it is of importance to use the right concentration/amount of fibronectin. Wijelath and colleagues previously demonstrated that fibronectin promotes the expression of endothelial cell-like patterns, most likely in combination with VEGF36. In the next step of the protocol, the importance of CD34+-selection of the cell suspension was investigated, comparing cells isolated after 7 days of culture on fibronectin-coated dishes, with and without previous CD34+-selection. The amount of cells missing both markers (acLDL uptake and CD31 expression) was much higher after cell isolation without previous CD34+-selection compared to isolation including this step. Interestingly, after seven days of culture on fibronectin, cells missing CD34+-selection showed a less homogenous cell population, as indicated by the inhomogeneous expression of CD31 compared to cells, isolated with CD34+-selection. These data show that CD34+-selection is necessary to sort out EPCs from other monocytes/macrophages. During the establishment of this protocol, we found that CD34+-selection in MV2 medium at 37 °C leads to an increased number of surviving cells, when compared with much lower temperatures, which needs to be cautiously investigated in future studies. We have to acknowledge that when applying this protocol, the antibody incubation in calcium-containing medium at 37 °C may lead to non-specific interactions and binding. In the future, buffer systems lacking calcium at lower temperatures should be tested and established to avoid this potential confounding factor. Notably, during our preliminary analysis of cell migration experiments with serum samples, measurements were first performed using a fluorescence microplate reader and calcein-staining of the cells, as previously described for different cells types (e.g. human umbilical vein endothelial cells, HUVEC)37. The different extinction values between the chambers indicated that not only the serum samples alone, but also the medium already have a remarkable influence on the measured fluorescence, which needs to be considered cautiously. Therefore, we adapted our protocol and switched to a measurement system in which the cells can be observed via light microscopy and counted by a semi-automated software. While EPCs account for approximately 0.1% of cells in the peripheral blood and it is difficult to isolate these specific cells38, an impressive number of studies indicated that EPCs may provide beneficial effects and improve tissue vascularization after ischemic events in limbs and in the myocardium39,40. Yet, it is still an ongoing challenge to translate these findings into clinical practice and to evaluate its clinical relevance. The reasons may be due to the significant influence of many perioperative factors on the secretion of different chemoattractants, which has been shown previously22,41. Therefore, in the second part of this study, the role of different cytokines on the migration of EPCs in the setting of myocardial I/R were evaluated. Therefore, the serum concentrations of cytokines in cardiac surgery patients were measured. MIF, as well as CXCL12 and CXCL8 showed a significant intra-operative increase. When translating these findings back into the in vitro experiments, present results demonstrated that there is neither a CXCL12- nor CXCL8-mediated effect on EPC migration at the measured physiological concentrations in vitro. Using the described EPC isolation model and the subsequent migration assay, MIF was identified as a predominant mediator of EPC migration42. In this context, Kanzler et al. demonstrated in an experimental mouse model that MIF and VEGF provide the strongest effect on EPC migration under hypoxia23. Interestingly, measurements of VEGF show that there is no significant intra-operative change in VEGF blood concentrations, which may result from binding of VEGF to the intraoperative standardized application of heparin. Therefore, MIF may play a predominant role among the angiogenic chemokines in the recruitment of EPCs in cardiac surgery patients and may initiate and contribute to the healing process after myocardial I/R through trafficking of EPCs to the site of injury43,44 Yet, as MIF levels increased immediately after myocardial I/R, it remains speculative whether the MIF-mediated effect on the recruitment of EPCs may influence cardiac remodeling and angiogenesis, which have significant implications in the prevention of heart failure after myocardial I/R23. However, before advancing to such analysis, it is important to further characterize the different subtypes of EPCs and to evaluate its functional role in human biology. In this connection, the present protocol provides a reliable method on how to isolate EPCs from human peripheral blood to enable its further comprehensive characterization and future studies. Emontzpohl, C., et al. Key role of MIF in the migration of endothelial progenitor cells in patients during cardiac surgery. Int J Cardiol. 181C, 284-287 (2014). Smadja, D. M., et al. Interleukin 8 is differently expressed and modulated by PAR-1 activation in early and late endothelial progenitor cells. J Cell Mol Med. 13, (8B), 2534-2546 (2009). Asahara, T., et al. Isolation of putative progenitor endothelial cells for angiogenesis. Science. 275, (5302), 964-967 (1997). Simons, D., et al. Hypoxia-induced endothelial secretion of macrophage migration inhibitory factor and role in endothelial progenitor cell recruitment. J Cell Mol Med. 15, (3), 668-678 (2011). Dernbach, E., et al. Antioxidative stress-associated genes in circulating progenitor cells: evidence for enhanced resistance against oxidative stress. Blood. 104, (12), 3591-3597 (2004). Yang, Z., et al. Paracrine factors secreted by endothelial progenitor cells prevent oxidative stress-induced apoptosis of mature endothelial cells. Atherosclerosis. 211, (1), 103-109 (2010). Asahara, T., Kawamoto, A., Masuda, H. Concise review: Circulating endothelial progenitor cells for vascular medicine. Stem Cells. 29, (11), 1650-1655 (2011). Schmidt-Lucke, C., et al. Reduced number of circulating endothelial progenitor cells predicts future cardiovascular events: proof of concept for the clinical importance of endogenous vascular repair. Circulation. 111, (22), 2981-2987 (2005). 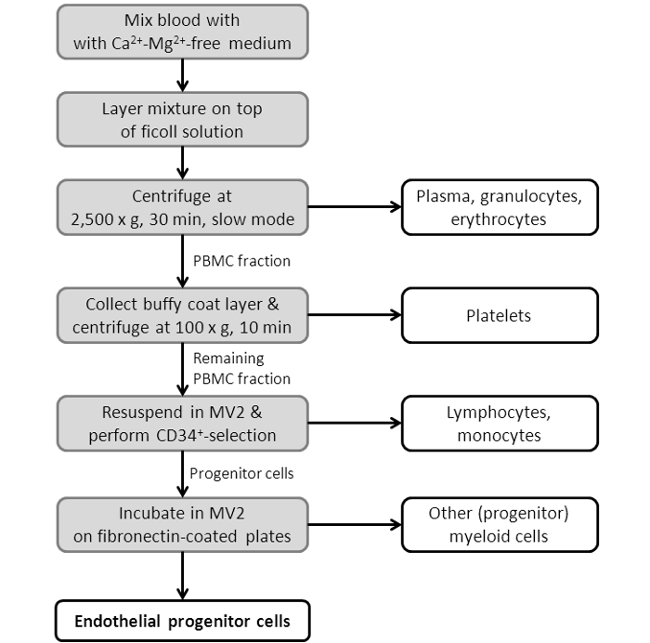 Yoder, M. C. Human endothelial progenitor cells. Cold Spring Harb Perspect Med. 2, (7), a006692 (2012). Ito, H., et al. Endothelial progenitor cells as putative targets for angiostatin. Cancer Res. 59, (23), 5875-5877 (1999). Hill, J. M., et al. Circulating endothelial progenitor cells, vascular function, and cardiovascular risk. N Engl J Med. 348, (7), 593-600 (2003). Yoder, M. C., et al. Redefining endothelial progenitor cells via clonal analysis and hematopoietic stem/progenitor cell principals. Blood. 109, (5), 1801-1809 (2007). Rohde, E., et al. Blood monocytes mimic endothelial progenitor cells. Stem Cells. 24, (2), 357-367 (2006). Rohde, E., et al. Immune cells mimic the morphology of endothelial progenitor colonies in vitro. Stem Cells. 25, (7), 1746-1752 (2007). Prokopi, M., et al. Proteomic analysis reveals presence of platelet microparticles in endothelial progenitor cell cultures. Blood. 114, (3), 723-732 (2009). Voyta, J. C., Via, D. P., Butterfield, C. E., Zetter, B. R. Identification and isolation of endothelial cells based on their increased uptake of acetylated-low density lipoprotein. J Cell Biol. 99, (6), 2034-2040 (1984). Koch, S., Claesson-Welsh, L. Signal transduction by vascular endothelial growth factor receptors. Cold Spring Harb Perspect Med. 2, (7), a006502 (2012). Hirschi, K. K., Ingram, D. A., Yoder, M. C. Assessing identity, phenotype, and fate of endothelial progenitor cells. Arterioscler Thromb Vasc Biol. 28, (9), 1584-1595 (2008). Hur, J., et al. Characterization of two types of endothelial progenitor cells and their different contributions to neovasculogenesis. Arterioscler Thromb Vasc Biol. 24, (2), 288-293 (2004). Tagawa, S., et al. Determination of Early and Late Endothelial Progenitor Cells in Peripheral Circulation and Their Clinical Association with Coronary Artery Disease. Int J Vasc Med. 2015 (2015). Bernhagen, J., et al. MIF is a noncognate ligand of CXC chemokine receptors in inflammatory and atherogenic cell recruitment. Nat Med. 13, (5), 587-596 (2007). Stoppe, C., et al. Interaction of MIF Family Proteins in Myocardial Ischemia/Reperfusion Damage and Their Influence on Clinical Outcome of Cardiac Surgery Patients. Antioxid Redox Signal. 23, (11), 865-879 (2015). Kanzler, I., et al. Differential roles of angiogenic chemokines in endothelial progenitor cell-induced angiogenesis. Basic Res Cardiol. 108, (1), 310 (2013). Walenta, K. L., Bettink, S., Bohm, M., Friedrich, E. B. Differential chemokine receptor expression regulates functional specialization of endothelial progenitor cell subpopulations. Basic Res Cardiol. 106, (2), 299-305 (2011). Rassaf, T., Weber, C., Bernhagen, J. Macrophage migration inhibitory factor in myocardial ischaemia/reperfusion injury. Cardiovasc Res. 102, (2), 321-328 (2014). Stoppe, C., et al. High postoperative blood levels of macrophage migration inhibitory factor are associated with less organ dysfunction in patients after cardiac surgery. Mol Med. 18, 843-850 (2012). Amin, M. A., et al. Migration inhibitory factor mediates angiogenesis via mitogen-activated protein kinase and phosphatidylinositol kinase. Circ Res. 93, (4), 321-329 (2003). Kupatt, C., et al. Embryonic endothelial progenitor cells expressing a broad range of proangiogenic and remodeling factors enhance vascularization and tissue recovery in acute and chronic ischemia. FASEB J. 19, (11), 1576-1578 (2005). Colotta, F., et al. Expression of a monocyte chemotactic cytokine by human mononuclear phagocytes. J Immunol. 148, (3), 760-765 (1992). Casale, T. B., Kaliner, M. A rapid method for isolation of human mononuclear cells free of significant platelet contamination. J Immunol Methods. 55, (3), 347-353 (1982). Lewandowska, K., Kaplan, D., Husel, W. CD34 expression on platelets. Platelets. 14, (2), 83-87 (2003). Stellos, K., et al. Platelet-derived stromal cell-derived factor-1 regulates adhesion and promotes differentiation of human CD34+ cells to endothelial progenitor cells. Circulation. 117, (2), 206-215 (2008). Thornton, M. A., Poncz, M. In vitro expansion of megakaryocytes from peripheral blood hematopoietic progenitors. Methods Mol Med. 31, 337-345 (1999). Ivetic, N., et al. Producing megakaryocytes from a human peripheral blood source. Transfusion. 56, (5), 1066-1074 (2016). 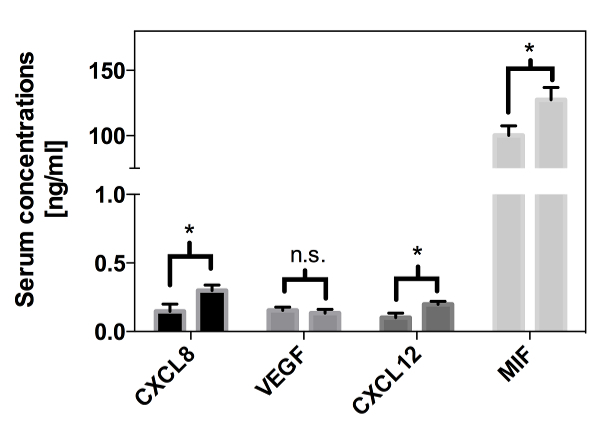 Friedrich, E. B., Walenta, K., Scharlau, J., Nickenig, G., Werner, N. CD34-/CD133+/VEGFR-2+ endothelial progenitor cell subpopulation with potent vasoregenerative capacities. Circ Res. 98, (3), e20-e25 (2006). Wijelath, E. S., et al. Novel vascular endothelial growth factor binding domains of fibronectin enhance vascular endothelial growth factor biological activity. Circ Res. 91, (1), 25-31 (2002). Hulkower, K. I., Herber, R. L. Cell migration and invasion assays as tools for drug discovery. Pharmaceutics. 3, (1), 107-124 (2011). Yao, E. H., et al. Effects of the antioxidative beta-blocker celiprolol on endothelial progenitor cells in hypertensive rats. Am J Hypertens. 21, (9), 1062-1068 (2008). Takahashi, T., et al. Ischemia- and cytokine-induced mobilization of bone marrow-derived endothelial progenitor cells for neovascularization. Nat Med. 5, (4), 434-438 (1999). Kawamoto, A., et al. Therapeutic potential of ex vivo expanded endothelial progenitor cells for myocardial ischemia. Circulation. 103, (5), 634-637 (2001). Kim, B. S., et al. Myocardial Ischemia Induces SDF-1alpha Release in Cardiac Surgery Patients. J Cardiovasc Transl Res. 9, (3), 230-238 (2016). Frangogiannis, N. G., Smith, C. W., Entman, M. L. The inflammatory response in myocardial infarction. Cardiovasc Res. 53, (1), 31-47 (2002). Zernecke, A., Bernhagen, J., Weber, C. Macrophage migration inhibitory factor in cardiovascular disease. Circulation. 117, (12), 1594-1602 (2008). White, D. A., et al. Pro-inflammatory action of MIF in acute myocardial infarction via activation of peripheral blood mononuclear cells. PLoS One. 8, (10), e76206 (2013).